Cretia and I grew up in neighboring states, she in Nebraska, me in Kansas. We met in Wyoming where we both made stops on our way to where life took us, Cretia to California, me to Colorado. We now sat in a patio café eating lunch while watching ice skaters glide over a man made rink a few yards away. The patio café is part of the Hotel del Coronado located on a peninsula just off San Diego Harbor in California in the beach community of Coronado. Cretia worked at the Hotel for eight years giving her an insight into the history of the place, which she shared with me on a tour after lunch. According to Building The Dream, Elisha Babcock, Jr. and Hampton Story created the Coronado Beach Company in April 1886 and followed with the establishment of a number of other enterprises, including the Hotel del Coronado, built in 1888. The hotel’s architecture offers a castle-like appearance in the Victorian era Queen Anne style with a roofline outlined in turrets, gables, dormers and round corner towers. Its fulgent red tiled roof contrasts with the subtle blueness of the Southern California sky. Inside, Cretia explained that the interior rafters contain no nails, with construction taking 11 months. The book notes that construction utilized a number of woods, including Douglas fir for framing, California redwood, hemlock and cedar for the exterior, Illinois white oak in the lobby and Oregon sugar pine, selected because it lacks knotholes, in the Crown Room. This fascinating hotel, filled with history and beauty, draws tourists from around the world. We decided I must come back sometime, take a room and explore the full scope of its history and architecture. When you think about it, we happen onto the people with whom we develop lasting friendships much as we stumble onto history. Cretia and I happened onto each other nearly 30 years ago when she answered an ad for employment. I handled accounting, inventory, shipping, receiving and some purchasing at a cattle hide company and needed an assistant. It took all of five minutes to decide this smart, attractive woman would be the perfect working partner. She was bright, cheerful and completely down to earth. I liked her immediately and it took little time for us to develop a compatible working relationship that soon matured into friendship. We found much in common, including a love of books and animals. 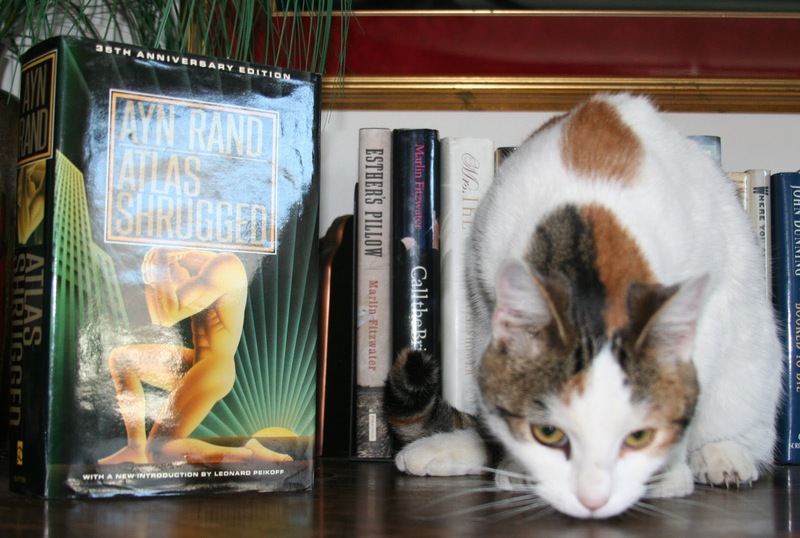 Cretia credits me with giving her a copy of Atlas Shrugged, something I could have done, but do not remember. I credit her with giving me a Calico cat named Kate, something she did, but does not remember. She also does not remember encouraging me to pursue my writing career by purchasing a weekly newspaper, but I do. That decision, made with her encouragement, changed my life in many good ways and I credit her for giving me the courage to write. Cretia now lives, surround by books, with her husband Dave and two boxers, Maggie and Ringo, in San Diego. I, now retired after publishing a weekly newspaper for 27 years, live in Colorado with my eight-pound wonder Poodle, Brieanna and Katy Joe, my third Calico cat. Books fill my house as well. Cretia and I admit to reading critically and loving the look and feel of books. Our common interests no doubt explain why we can go years without seeing each other and immediately fall into conversation as if our last visit happened yesterday. As we sat on the Hotel Del Coronado patio basking in the warm California sun, we enjoyed soup and salad. Amazingly, we even tend toward the same kinds of food. Cretia chose the clam chowder with a spinach salad dressed with pear slices, candied pecans and blue cheese. I selected the same salad, but opted for the butternut squash soup because it contained truffles, something I wanted to experience. We decided to hold off on wine until later that evening, when Dave joined our conversation and we heavily debated politics. Our visit ended much too soon, but implanted more cherished memories of a dear friend. It was easy, once back at home, to duplicate the salad and butternut soup minus the truffles, but fresh clams for chowder are hard to come by on the high plains of Colorado. Still, chowder stayed on my mind so I decided to make a fish chowder based on a recipe I found in my latest copy of Cooks Illustrated. This recipe makes enough for one large or two small servings. 1. Coat 1-quart saucepan with oil and add bacon. Sauté over medium-high heat until crisp, 3-4 minutes. 2. Remove bacon and drain on paper towel. Remove all but about 1 teaspoon of the bacon grease from saucepan. 3. Add onion and celery to saucepan and sauté until soft, 2-3 minutes. 4. Add water, thyme, bay leaf and seasonings to saucepan and bring to boil. 5. Place fish fillet in boiling water. Remove saucepan from heat and allow fillet to poach for five minutes. Remove fillet from saucepan and set aside. 6. Place potato in saucepan, bring to boil, lower heat and cook until potato is tender, 15-20 minutes. 7. Remove the bay leaf, flake fish and add to saucepan along with milk. Reheat soup, but do not allow to boil. Serve with your favorite crackers and garnish with the bacon bits. Thanks! I've been looking for a good chowder recipe. For folks not close to the ocean, canned clams are okay (not great, but certainly real easy) to use if you (a) buy whole clams, not chopped and (b) don't drain all the clam juice into your dish; it's sometimes very sandy at the bottom of the can.